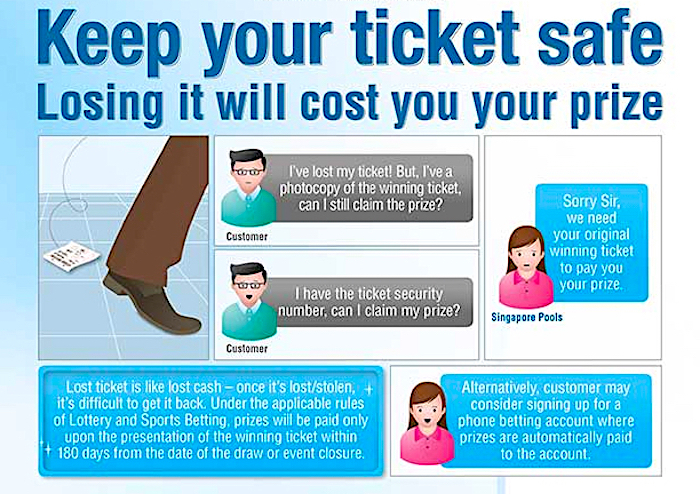 The Singapore Lottery made this infographic to advise on how to safeguard your lottery ticket. The Singapore Pools website went on to say this: A winning ticket must not be torn, mutilated, defaced or disfigured in any way. If the ticket cannot be read by our terminals, you will not be able to claim your prize. Every customer must exercise due care and diligence in safeguarding his/her winning ticket. Lost ticket is like lost cash. Singapore Pools does not have the responsibility and will not investigate into the purported theft or trace the misplaced/lost ticket. The closed circuit cameras at our branches/outlets are for general security surveillance only. The video footages are not meant to prove customer's identity or to validate bet/transaction details. To safeguard customer's privacy, Singapore Pools will not entertain request for release of video footages.